I was just a little disappointed with this year's birthday celebration(s) because the new job doesn't allow me to spend the entire week celebrating and not go to work. Boo! Also, the jetlag caused both S and i to be yawning throughout my birthday dinner at Rakuichi (read review here) and then miss our Gold Class movie. 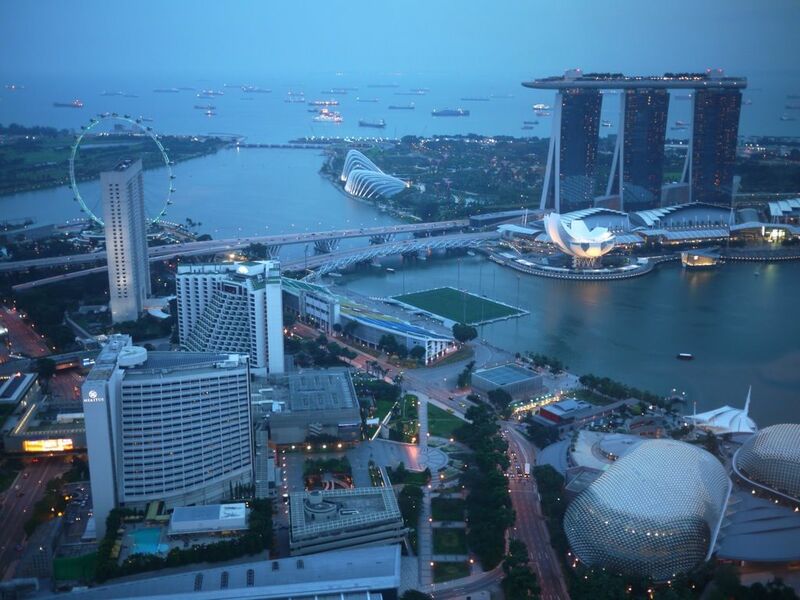 To make up for the underwhelming celebrations, S decided to surprise me with an overwhelmingly beautiful treat at Jaan, Swissotel The Stamford, Singapore. He gave me no clue other than telling me to be my pretty self. Boys, please be a little more specific even if you wanna spring your date a surprise. Dress code for one is very important. I had to tease the details out of him and he was very careful not to let the cat out of the bag knowing how much of a PI i am. I'm glad i didn't ask too much, if not we would have missed this beautiful sight. 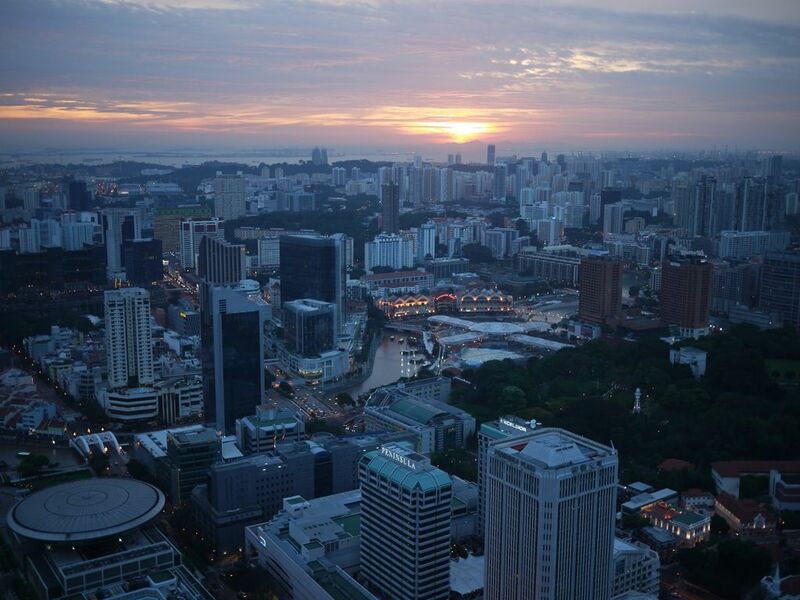 My very first sunset in Singapore, from the top, looking down on one of the most beautiful sight of Singapore. I could stand there and watch this forever but my tummy was protesting by then. Into the dining room we went and we were greeted by the stunning Murano crystal and silver free-form chandelier that spans the entire length of the ceiling. The view from Jaan's side is not as spectacular as Equinox's though i'm sure the food is more stellar. 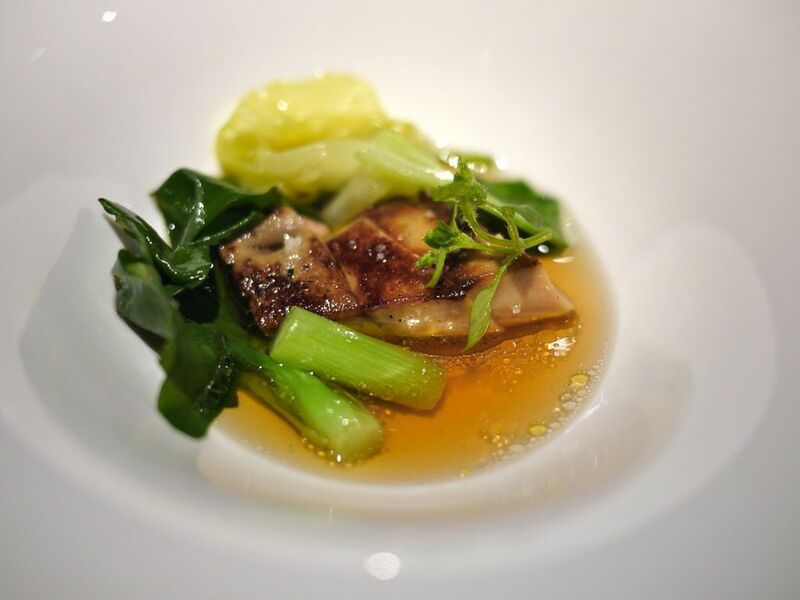 Our meal is designed by Chef de Cuisin Julien Royer, a young chef who brings with him the unique taste of Cantal, Auvergne, France. Growing up on a farm developed in him a great appreciation of pure and organic ingredients and 'simplicity' (so he says) in his dishes. 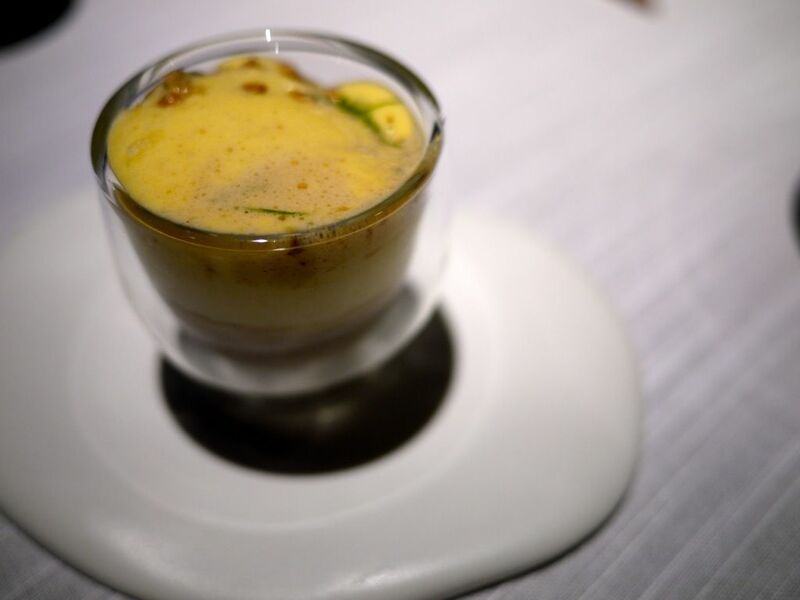 Seasonal ingredients are used to ensure freshness and thus the flavors will be different each quarter you visit. 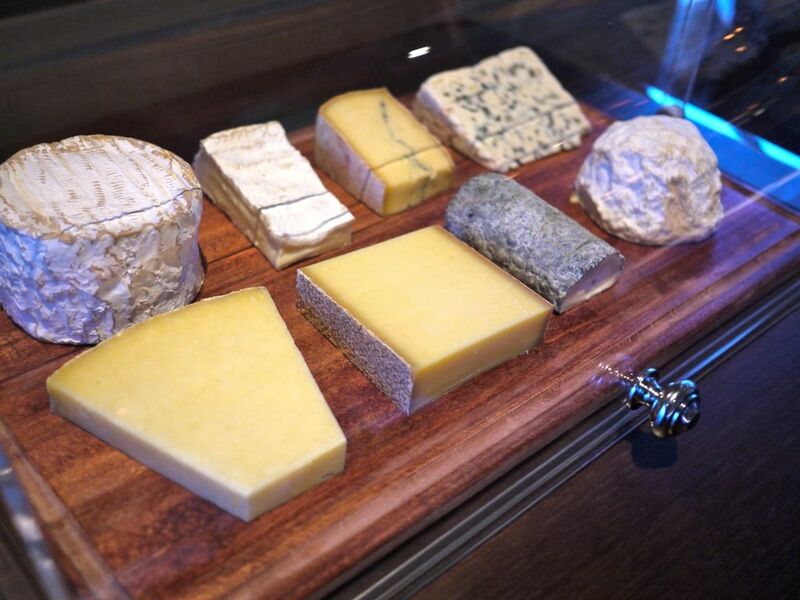 Here is our 7 course Winter Prestige Menu. 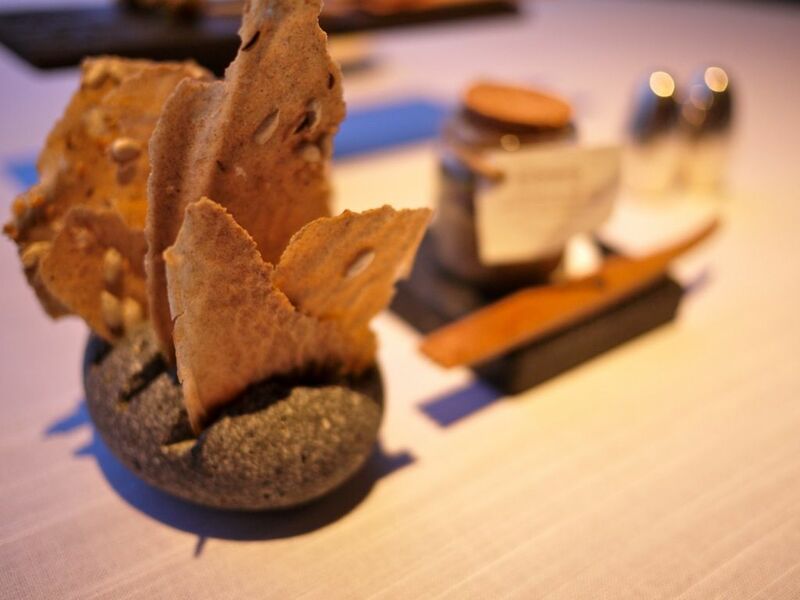 Amuse Bouche- Chestnut and Lentil Hummus with cracker. Very interesting sweetness with a little of that spice from the lentils. 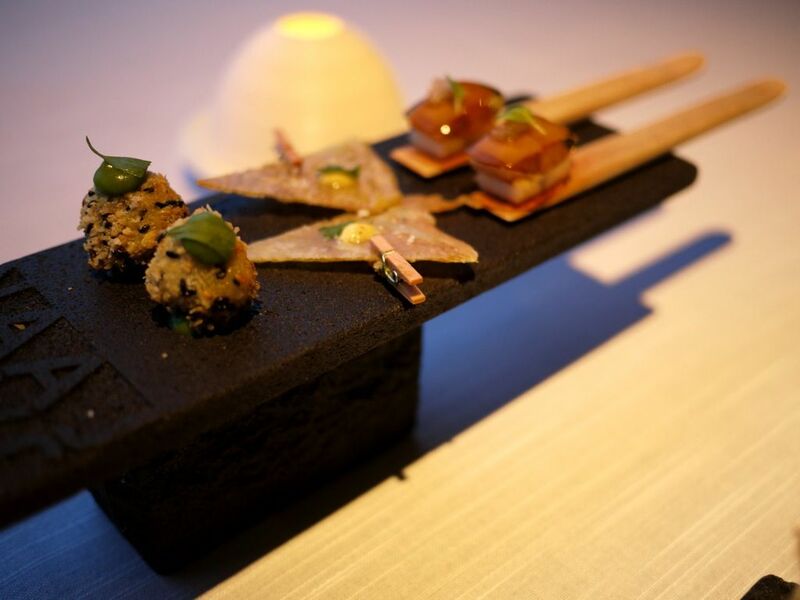 Amuse Bouche- On the left, some fried cheese balls with sesame, fried chicken skin and the third a foie gras pate on cracker with a jelly broth (if i didn't get that wrong). My stomach was starting to fill up a little and we are still on the Amuse Bouche! This is some soup, kinda Japanese style bonito soup, served with some bisque foam and rice pops and mushrooms (i think it's truffles). 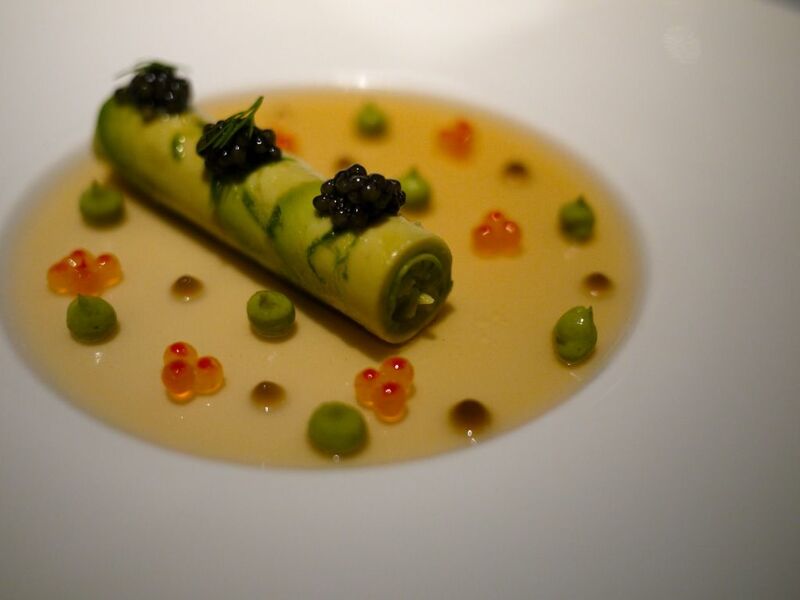 Our first course: Wild Caught Langoustine and Avocado Canneloni, served on top of a light crustacean jelly, ikura and Oscietra Caviar. This is a light seafood dish which is served cold. I like how the jelly is bisque infused. Needless to say i polished every bit of this. 2nd Course is one of my favorite dishes from Jaan. One of their signatures too. 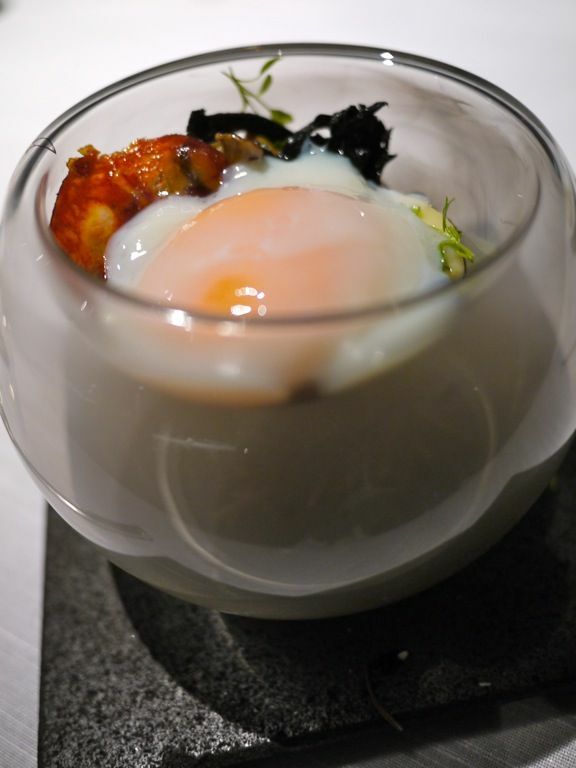 The 55' Rosemary Smoked Organic Egg with smoked rattes, autumn mushrooms and chorizo iberico. Perfect breakfast food that i would eat any time of the day. The smoked rosemary reminded me of our previous experience at Mikuni (read it here). 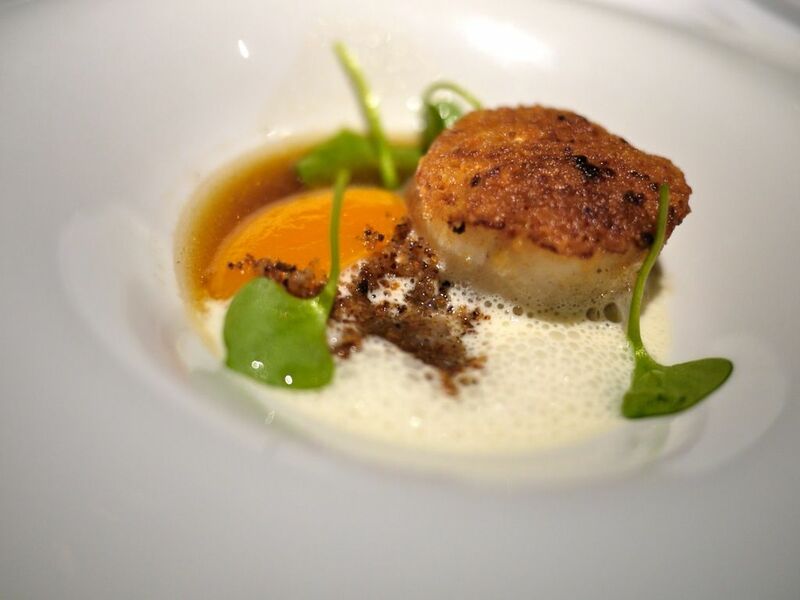 Third Course: Roasted Hokkaido Scallop, Viennoise, Musquee Pumpkin, in Beurre Noisette (a brown butter sauce that tastes nutty). Call me traditional but i thought there was a little too much done to the scallop ie the crumbly top. This dish was a little sweet for my liking but it's good nonetheless. After the Confit Atlantic Turbot Tournedos- the fillet mignon of the turbot was served, i concluded that Julien likes the color orange and he also likes it in the puree form. He probably also has a sweet tooth as the dishes tended to be a little sweet. 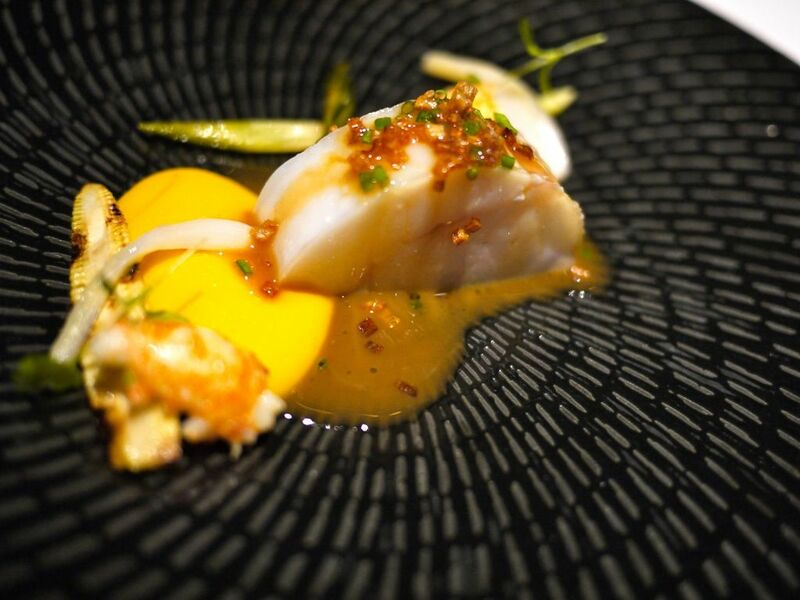 The crystal clear oily fish was served with char-grilled leeks, Hokkaido corn, baby crayfish and Jus Dolce Forte. Nicely executed but not memorable. My phobia of pigeon was caused by Hibiscus in London, which served me a pigeon that looked and tasted like road kill. The only pigeon i can take is the Hong Kong roasted sort. 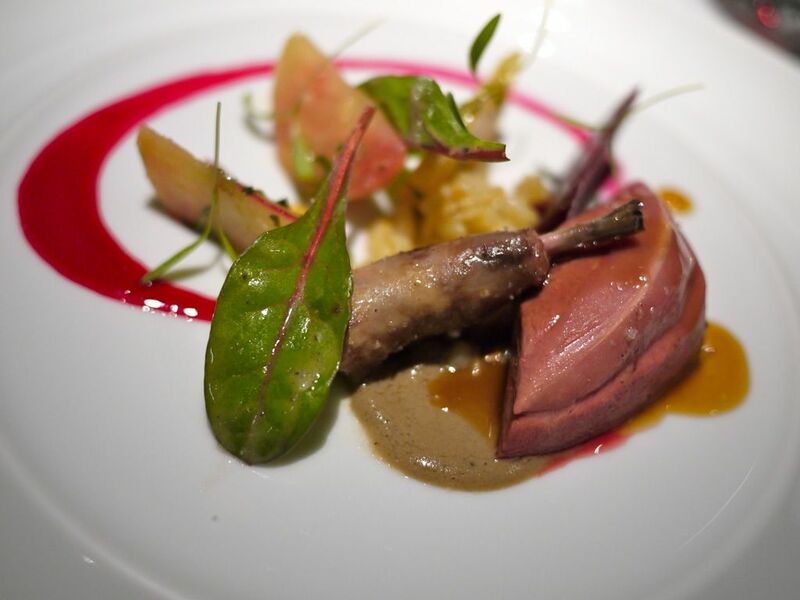 The Hay Roasted Bresse Pigeon breast with confit leg by Julien was a whole lot better than Hibiscus' but it's hard to wipe that taste and texture out from my mind. If you are afraid of the gaminess, perhaps ask for something more well done. I enjoyed the organic beetroot, barley, Jus D'abats a lot better than the meat. Me with my scary pigeon. Gulps. 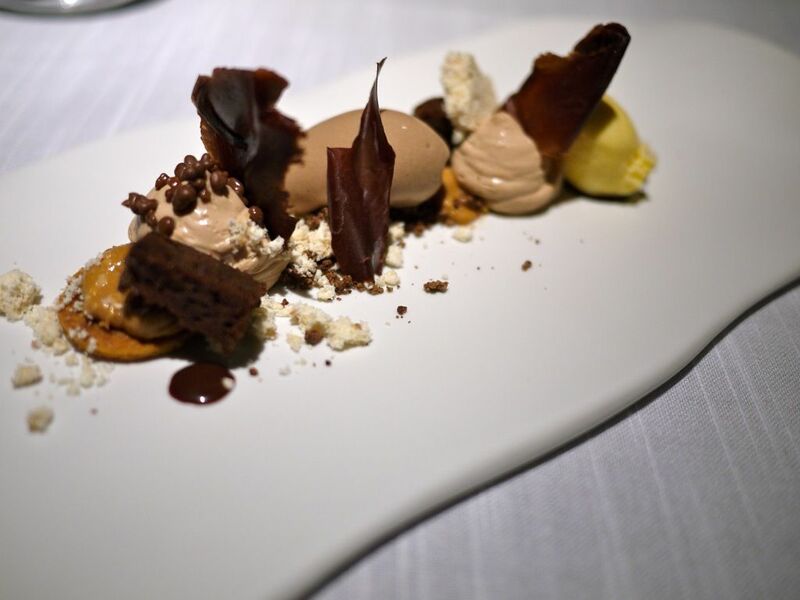 Desserts was the 4th Generation of Choconuts, a staple at Jaan but it is currently on its version 4. Sable Breton, textures of white, milk and dark chocolate in biscuit, crumble, aerated, creamed, meringue, flakes and ice cream form. There was also a surprise with those crackly pops in the chocolate bits. I thought my mind was playing tricks at first.. but.. The same thing appeared in the Petit Fours. 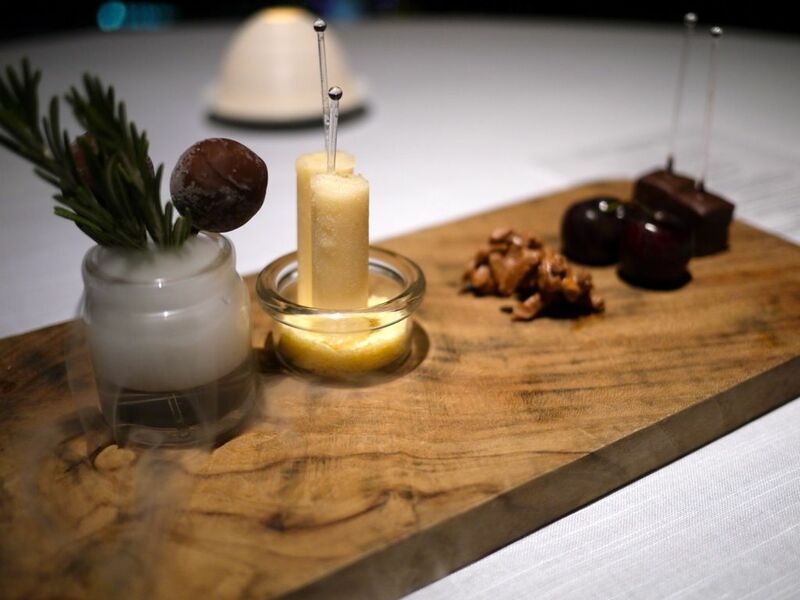 A passion fruit sorbet served with crackly pops! It's like Julien's way of owning up to his little trick in the earlier course. Lovely chocolate bites here. Great sweet ending to our lovely meal. There are about 3 menus to pick from and the minimum is a 5 course for dinner. I kinda regretted not doing that as there is some wagyu or beef short ribs and you know how i love my red meats (not pigeon). So yea. 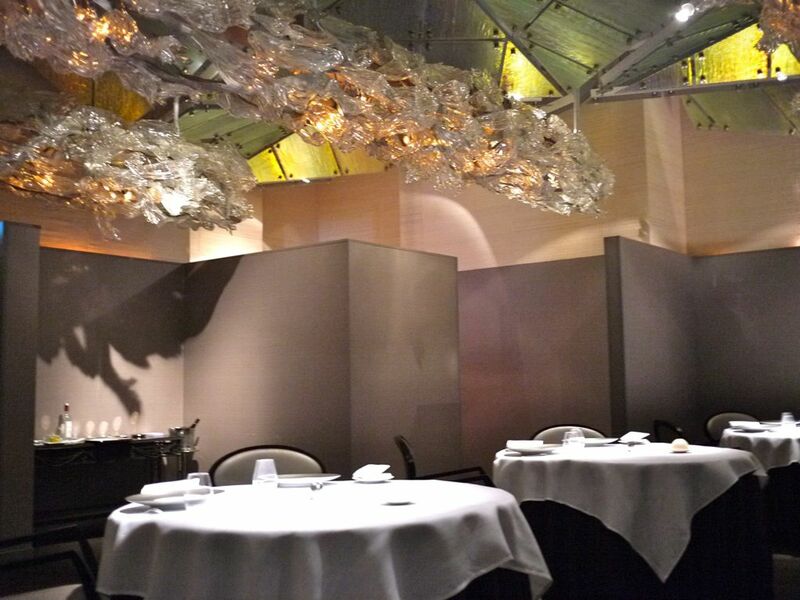 Jaan, great place for the special occasion. Closed on Sunday and PH, dinner is available daily except PH. I was at Jaan before this chef and it was only so-so. But this chef looks like he's doing a good job. Thanks! It's not too bad i feel. Helps that he's so cute too! Hehe.. Wait, isn't the chef before Andre Chiang? Anyway, after looking your review, makes me regret taking the 5-course! Okay, I will post mine up soon you compare the dishes. Yours look so much better! Wow, what a nice post. Great write up. I really enjoyed while i am reading this post. I love French culture, French food, French life style. Last summer i have visited France as well as i have enjoyed this vacation.